On Tuesday Aldi held a consultation event at the Salvation Army Hall on Church Street, to introduce plans for a store on Newbridge Hill. 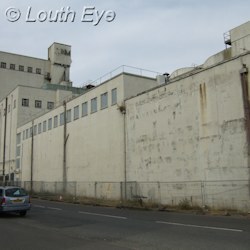 This would mean the demolition of the ABM building, also known as the Malt Kiln. We've been here before. 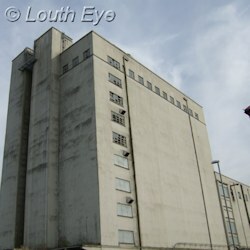 In January 2004 demolition of the Malt Kiln began, but it was halted soon after due to unexpected costs. I remember the sound of a giant crane pummelling the building rang out across the whole town. The representative of Aldi I spoke to at the meeting told me that they would be able to afford to bring it down and complete the work. They don't believe the concrete walls contain asbestos, for instance. After over nine years of non-demolition I think I'll believe it when I see it. Newbridge Hill can get very busy, and as a pedestrian it doesn't seem very safe to negotiate. This is partly down to the curve in the road, and also the speed that vehicles tend to go in that area. If a food store were built, it would lead to both larger levels of foot traffic, and a slight increase in road traffic from shoppers. There will also, very probably, be more traffic in Louth as a whole as the result of various proposed developments, since Louth is one of the areas ELDC has designated as suitable for more housing. So this is one of the areas that developers will have to look at, and perhaps that will mean another pedestrian crossing, or traffic calming measures. About two-thirds of Aldi's development is designated for car parking, which would make 145 spaces available. Even though the Malt Kiln is huge, satellite images show it doesn't take up the majority of the site at the moment. I'm not sure how much of the rest of that is asphalt. Since the site is on a hill there's little concern about it flooding. However, the town as a whole has problems with surface water drainage, so we have to be wary about creating impermeable surfaces that will overload Louth's Victorian drainage system. 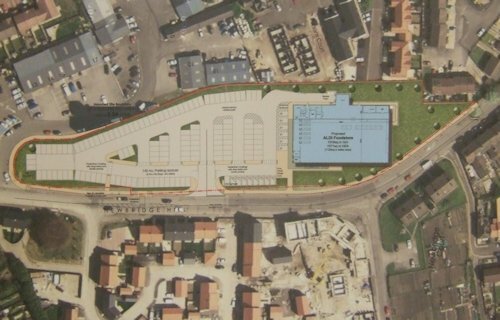 The plans show some green space bordering the car park and the store. Ideally, I'd like to see the car park paved with a permeable surface so the run-off from that doesn't create problems for the rest of the town. The store's design looks pretty much like a glass and steel box, and it's one high-ceilinged storey. Of course it's better than the rather ugly ABM building, so there's no question of wanting it to fit in with what was once there. But the proposed design isn't in keeping with the rest of Louth as a whole, and in my view we should be trying to strive for better design, rather than something that's just good enough to pass through planning. Red brick, a proper roof, and some detailing would be nice, although I'm not against an abundance of glass if it makes the store easier to heat. On the whole I like these plans, largely because the location is a good one, and the traffic problems shouldn't be insurmountable. Councillors and planning officers aren't supposed to take into account commercial viability in their planning decisions, but I do know there's a demand for a budget food store in that part of town. With 1125 square metres of sales floor space this is a relatively small store, so it won't make much of a dent on the town centre's trade. Although I don't buy their assertion that "no discount food operator is present in Louth to date" (Heron? Bargain Buys? ), an Aldi on Newbridge Hill looks like a positive development.